1 What is the purpose of the physical link control field in a data link layer header? addressing -> This field helps to direct the frame toward its destination. error detection -> This field checks if the frame has been damaged during the transfer. type -> This field is used by the LLC to identify the Layer 3 protocol. frame start -> This field identifies the beginning of a frame. 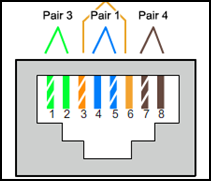 3 When is a wired connection preferred to a wireless connection by an end-user device? In fiber optic media, the signals are represented as patterns of “______”. 5 Which is a function of the Logical Link Control (LLC) sublayer? 6 An administrator measured the transfer of usable data across a 100 Mb/s physical channel over a given period of time and obtained 60 Mb/s. Which kind of measurement did the administrator obtain? Refer to the exhibit. One end of the cable is terminated as displayed, and the other end is terminated in accordance with the T568A standard. What type of cable would be created in this manner? 11 What is a characteristic of a WAN hub-and-spoke topology? The order of transmission is dictated by the node that asks first for the token. Each device has to transmit before passing the token to the next device. It is a very efficient method because there are no collisions. 13 Which statement describes a characteristic of the frame header fields of the data link layer?